February 16th 2019 is an important date in the diary of everyone associated with Chula Vista FC. This date signals the first round of the 2019 Cal South Adult State Cup. The tournament will take place across February, March and April this year, with the final being held on April 27th. Not only that but there is great news regarding the prize money for this year’s event. As if lifting the trophy in itself is not enough motivation to take part in the competition, the 2019 Cal South Adult State Cup Men’s Premier Division has prize money totalling $64,000. This is a significant amount of money and for a club like Chula Vista FC, it could be invested in the club to improve facilities, training equipment and much more. Last season, Chula Vista FC enjoyed a thrilling journey to the final of the 2018 Cal South Adult State Cup Men’s Open Division Championship final. It was a great run in a tournament Chula Vista FC had yet to win and the final would be played against San Nicolas FC at Cal State Fullerton’s Titan Stadium. San Nicolas were tough opposition, having come fourth in the 2017 Cal South Adult State Cup Men’s Division and therefore had the edge in terms of experience in the competition. However, it did not take long for Chula Vista FC to settle into the match and Alberto Diaz opened the scoring with a right-footed strike. San Nicolas did not give up easily and fought back in the second half, scoring an equaliser to make it 1-1. The game was in the balance and the crowd on edge but it was Chula Vista who responded to the pressure. Diaz struck his and Chula Vista FC’s second goal of the game to win the match and lift the 2018 Cal South Adult State Cup Men’s Open Division Cup. It was a huge moment for the club and one which will live long in the history of Chula Vista FC but it is time to look toward the future. How would you like the chance to represent Chula Vista FC in the 2019 Cal South Adult State Cup Men’s Premier Division? Imagine having the opportunity to score a goal in the final and lift what is a fantastic trophy before celebrating with your team mates. You have the opportunity to do just that thanks to the Chula Vista FC Try-outs. 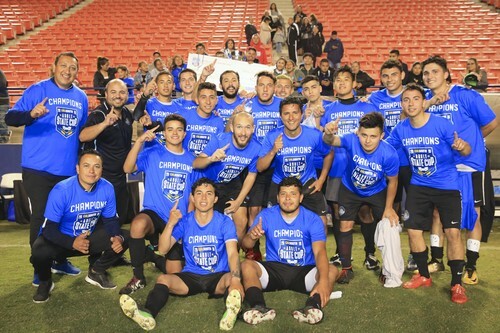 Chula Vista FC are the defending Champions and you could become part of the next group of players to participate and win the Cal South Adult State Cup.